A tram trundling through early-morning mist on Chitpur Road ' the dome of Nakhoda Masjid looming behind ' is not a symbol of a happening city. But the image typifies the mindscape of Ananta Mandal, who is steeped in myriad hues and nuances of old Calcutta. 'The tram is my favourite city transport for its rhythm, aristocracy, comfort quotient and several other factors. It's the identity of the city and should not be scrapped,' said the 23-year-old artist, who recently held his second solo exhibition, The Kolkata, at Academy of Fine Arts. Fourteen paintings, mainly in acrylic and watercolour, were on display . 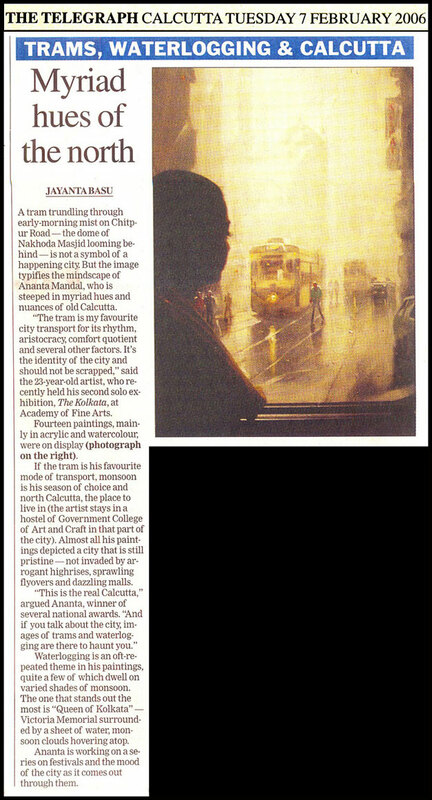 If the tram is his favourite mode of transport, monsoon is his season of choice and north Calcutta, the place to live in (the artist stays in a hostel of Government College of Art and Craft in that part of the city). Almost all his paintings depicted a city that is still pristine ' not invaded by arrogant highrises, sprawling flyovers and dazzling malls. Waterlogging is an oft-repeated theme in his paintings, quite a few of which dwell on varied shades of monsoon. The one that stands out the most is 'Queen of Kolkata' ' Victoria Memorial surrounded by a sheet of water, monsoon clouds hovering atop. Ananta is working on a series on festivals and the mood of the city as it comes out through them.